Ex Swangz Avenue female artist, Irene Ntale, was yesterday appearing on NBS TV to premiere her latest song dubbed Stamina Daddy, it seems to be one of her best projects from the time she went solo. Irene was all dressed in black and black shades. The 'He Go Down' singer revealed that life was all good after withering the storm from all those who thought that she could not make it without her record label that saw her clinch colloboration songs from top shots like Chameleone and Bebe Cool. Easy and Love Letter are the collaboration songs she did with Chamili and Bebe respectively. As the interview progressed, Irene was asked about her love life, she sent mixed signals, first she said Hi to her lover who was watching and in an instant, she changed by saying I'm lying. The show host, Tuff B, wondered why most female artists are single. Irene noted that both relationships and music require a lot of time, so you should be prepared to accord them time to benefit. "People out there think we female artists are loose, which is not the case. When I'm not on stage or in the studio, I'm human and I have feelings too. Some fear dating us because of the number of fans following us, they also think we have multiple partners out there, it's not true and not good to think of us that way." "The man who will marry me will be a very lucky man," she concluded. Irene Ntale went on to reveal how she already has two collaboration songs with Nigerian artist, Mr. Eazy and Ghanaian afro pop dance-hall and reggae artist, Stone Bwoy, they will be released in 2018. 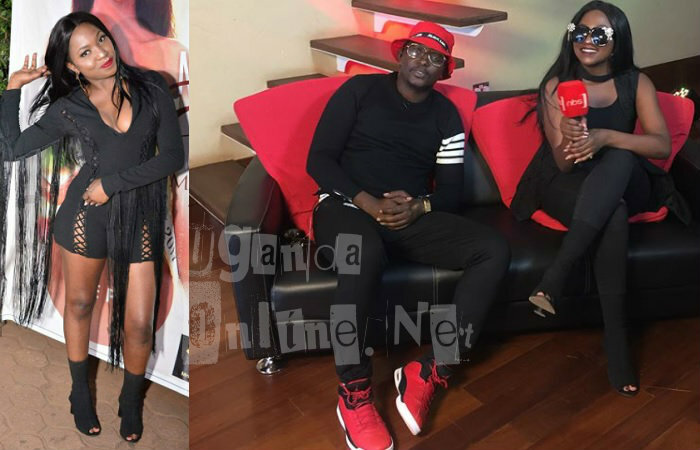 Last Friday, she was at Club Amnesia also for the premiere of the Stamina Daddy video.